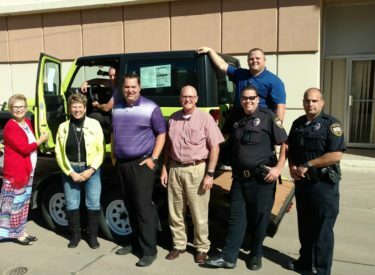 The Western Kansas Child Advocacy Center (WKCAC) is partnering with the Liberal Police Department and other Law Enforcement Agencies in Western Kansas to help victims of child sexual and physical abuse. You could win a 2017 Jeep Wrangler Sport. Tickets are $100 each and can be purchased from the Liberal Police Department. If you want a ticket please come to the Liberal Police Department and ask for your chance to win. There will only be 1500 tickets sold throughout the region. The drawing will be held on December 20, 2017 and you do not have to be present to win. Winner will receive a brand new 2017 Jeep Wrangler Sport, sales tax included. The approximate value of the package is $31,718. The WKCAC Staff and the services they provide have become crucial to families throughout Western Kansas who have been impacted by child abuse, and your support ensures that these services will continue to be available.